Introducing the first all-in-one guide to site furniture principles, processes, and best practices Furniture matters-outdoors as well as in. Understanding the connections between site and site furniture enhances the creative opportunities for designers of outdoor spaces and increases their ability to influence the long-term success of the spaces they design. Site Furnishings comprehensively examines how to elevate the design of site furnishings to achieve programming goals. 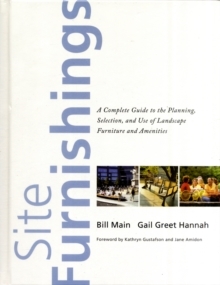 Intended for landscape architects, designers, and contractors, as well as urban planners and designers, civil engineers, and other professionals, this accessible resource explores the ways that furniture contributes to the quality of outdoor spaces, and provides conceptual tools, technical information, and examples of successful applications.